Partnership at eye level: Rohde & Schwarz offers customized service partner programs. Come and join them. The success of a mission depends on the reliability, security, availability and future-readiness of the communications equipment. The Rohde & Schwarz service partner program lets you benefit from a flexible service concept that ensures the availability of your devices and makes use of your own staff and infrastructure. To benefit in the long term from the functionality and accuracy of your radio equipment,you can choose from our range of service partner programs – all tailored to your requirements for operational deployment or for system integration support. Select the basic organizational level (O-level) service for scheduled maintenance including functional testing or the enhanced intermediate level (I-level) for repair including the replacement of device modules. You can choose the service level that meets your special requirements and also combine your expertise with that of Rohde & Schwarz. The general purpose test equipment enables you to self-service your airborne transceivers, meeting the highest quality, convenience and cost-efficiency requirements. The test equipment will be selected according to the required scope of servicing. Various Rohde & Schwarz training modules empower your staff to service your airborne transceivers on their own. Depending on the type of service partner agreement, you can use different training modules. As our partner you will receive all software updates and relevant documents that you need for preventive and corrective maintenance. A local pool of spare parts tailored to your requirements enables you to immediately perform preventive and corrective maintenance. This pool will be replenished when necessary. If necessary, we support and combine your own service activities with our authorized service partners or our central service organization in Germany. Depending on the required turnaround time, customized measures such as a reserved pool of spare parts can be arranged. Our service partners use the same test systems as Rohde & Schwarz. We are therefore able to reproduce any errors or problems on our reference system to help you solve the problem, quickly and competently. Rohde & Schwarz incorporates technical advances into its products and improves them throughout their entire lifecycle. As a service partner you benefit from this development. 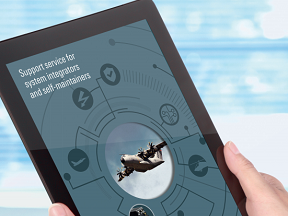 You will receive service notes that inform you about modifications and innovations. Use this opportunity to get evaluations and assessments for the new software and hardware features of your test system. Discuss all maintenance issues that come up with regard to your radios. Take a close look at the spare parts logistics for your equipment. Consult the technical experts from Rohde & Schwarz and clarify open questions. Please enter a product type.